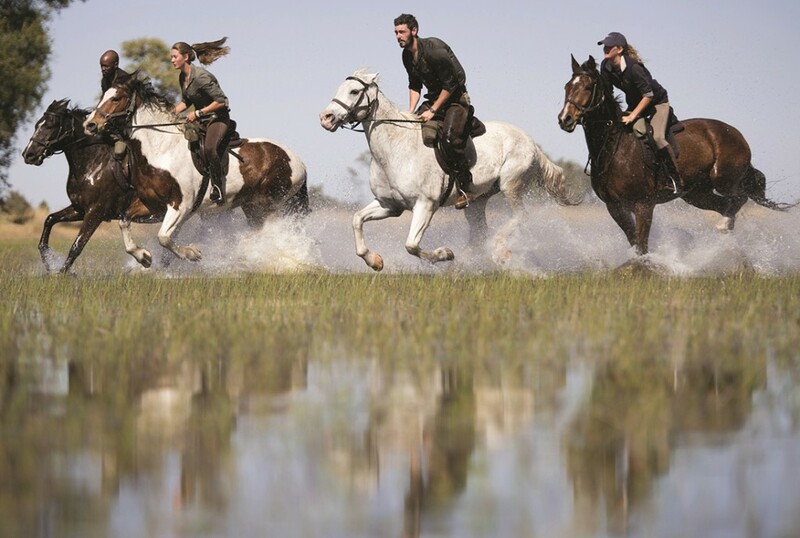 Belmond Eagle Island Lodge, a luxury safari lodge in the heart of Botswana’s Okavango Delta, introduces the first helicopter and horseback safari. Combining an aerial safari by private helicopter with a horse-ride through one of the world’s last true remaining wildernesses, the excursion offers a new way to explore the UNESCO world heritage site and its magnificent inhabitants. This unique sky and earth safari begins at dawn as the open-sided helicopter safari takes flight, offering uninterrupted aerial views across the delta. Guests can enjoy aerial views of the game rich landscape, abundant with roaming elephants, buffalo, giraffe and zebra, as the sun rises and the wildlife begins a new day. Following the helicopter flight, the safari continues on horse -back, accompanied by a specialised guide who will give a safety briefing before leading a trail through the bush, traversing palm-lined islands, grassy flood plains, mopane forests and clear streams. The intimate half-day or a full day experience gives even returning safari-lovers something new to discover, as guests will have the opportunity to get close to game which may otherwise be hidden from sight. Moving silently on the horses, riders are able to be at one with the wildlife around them and to observe game entirely undisturbed. Guests can move with animals during their daily migrations and follow them on their journey, unhindered by river crossings and difficult terrain that would rule out a game drive vehicle. Visitors could be so lucky as to ride alongside wild dogs on a hunt, elephants as they meander through the river systems, or follow herds of buffalo. The reserve is also home to notoriously private species such as leopard, African wildcat, and honey badgers, as well as smaller creatures like the warthog and tortoise which before now may go unspotted, concealed in the undergrowth. Belmond Eagle Island Lodge re-opened in November 2015 after an almost total rebuild with a contemporary take on luxe safari style. Positioned on a private island surrounded by river channels and floodplains, the lodge is Botswana’s ultimate water and experience-based safari lodge. The 12 tented guest rooms have walled outdoor showers, a private sundeck with plunge pool and walk-in wardrobe, as well as an over-sized double bed with views to the delta beyond the canvas. Together with Belmond Khwai River Lodge and Belmond Savute Elephant Lodge , both situated in the complementing ecosystem of Northern Botswana, the portfolio offers a truly diverse safari experience that will delight the most seasoned traveller. To book the safari experience, guests must have a mastery of the basic horse-riding skills, as well as an ability to trot for stretches of ten minutes at a time, to be comfortable at all paces and to be able to gallop. The minimum age requirement for the safari is 12 years old and persons under 18 years old must be accompanied by a parent or guardian. The horses are all full or part thoroughbreds including, Botswana Warm bloods, Pure Arab, Anglo Arab to Fresian Crosses.